As the liberal media here in Iowa continues to try to demonize the gun bill that was passed here in Iowa this year, I can hardly wait to see them explode as we push for Constitutional Carry next session! Of course, they are going to scream bloody murder, but all of their bluster and hype will be more of the same FAKE NEWS that you and I have come to expect from these out of touch editorial board. The out-of-touch argument’s that they’ll make are cookie cutter from what we’ve seen in other states. So to prepare you for dealing with anti-gun legislators, Bloomberg-funded activists at the Capitol, or even your naïve brother-in-law — we’re going to review some of these objections here. Here are some of the lies you can expect to hear. >>> First, by allowing people to carry without having to obtain government permission (and the accompanying background check,) Constitutional Carry will lead to blood in the streets. This claim is absolutely baseless, here are four reasons why. 1. We heard the EXACT same arguments when ‘Shall Issue’ was enacted in 2010, and by any objective standard, those concerns have been proven to be false. That’s because law-abiding gun owners are not the problem! 2. If Constitutional Carry did cause mass violence, why hasn’t it shown up in the other thirteen states that have Constitutional Carry laws on the books? It hasn’t because the notion is absurd. 3. The assumption that enacting Constitutional Carry will lead to more armed crimes is based on the silly construct that violent criminals are arming themselves in a legal manner to begin with. We all know that’s a lie. Criminals steal guns or buy them from fellow criminals — they aren’t waiting around to buy their first gun once we pass Constitutional Carry! 4. All of the paperwork, background checks, fees, and fingerprints do nothing to stop committed criminals who are bent on murder. Look at the Orlando nightclub shooting from last year. The shooter passed a background check to be an armed security guard, another to obtain a concealed carry license, abided by a 5-day waiting period to pick up his handgun, was interviewed multiple times by the FBI -– and still shot over 100 people! Bottom line, there are almost three hundred thousand Iowans who possess a concealed carry permit and, statistically, we’ve seen no increase in armed crime here in Iowa. That’s because law abiding gun owners in Iowa are not the problem. They weren’t the problem under our old ‘May Issue’ carry laws, they aren’t the problem under our current ‘Shall Issue’ carry laws, and they won’t be the problem under a ‘Constitutional Carry’ law. >>> Second, Constitutional Carry will invalidate my ability to travel across state lines as my permit will cease to exist. This one is easy to put to rest, as nothing about the current ‘Shall Issue’ process will change under a Constitutional Carry provision as it simply makes the permit optional. 1. If you want to obtain a permit –- you could still do so. 2. If you want to hang onto your existing permit — you would be able to do so. 3. If you want to travel across state lines — you could still do so with your Iowa permit. >>> Third, people will be walking around armed to the teeth with no training and will kill each other if they ever have to fire their weapon. There are so many things wrong with this logic it’s hard to know where to start. Here are a few things to consider. 1. Iowa Gun Owners loves training, and we wholeheartedly endorse it. That is why we’ve brought renowned trainers like Massad Ayoob to Des Moines to lead classes for IGO members. Training is important, but it’s not constitutionally mandated as a condition to ‘keep and bear arms.’ Many states have no requirement to seek training before carrying for self-defense. 2. Understand that most people who trot out this line of attack are getting paid to offer training classes themselves, and are scared of losing income. That’s 14 MILLION reasons why trainers oppose Constitutional Carry! A story came out in the news this past July about two Carroll County deputies who’d made over $128,000 teaching classes in just one rural Iowa county! 3. It’s not even true. When Idaho enacted Constitutional Carry in 2016, the state reported an INCREASE in the number of citizens who obtained firearm training in the 6-month period that followed enactment. It’s no surprise. Gun owners are reasonable and responsible people who take owning — much less carrying — a handgun very seriously and routinely seek out the best training they can afford. 4. This hasn’t manifested itself in the other thirteen states that have already passed Constitutional Carry into law. >>> Fourth, my sheriff/deputy opposes Constitutional Carry. 1. Your sheriff is a member of the aggressively anti-gun Iowa State Sheriffs’ and Deputies’ Association (ISSDA) — the most organized anti- gun lobby in Des Moines –- and they are being told to oppose this. 2. Law enforcement, under the ISSDA banner, has opposed every increase in Second Amendment freedom in this state in the last decade! Stand-Your-Ground law, Shall Issue, permit confidentiality, repeal of the permit to purchase, pre-emption reform, firearms free legislation, school carry –- the ISSDA has opposed them all. So any idea that your sheriff is an objective professional is just gone. He’s a part of what has become a blatantly partisan organization. 3. Money talks! As we all know, the vast majority of professional trainers here in Iowa are members of law enforcement and they are desperate to maintain their side income stream. As we mentioned above, a state audit last July showed that two deputies out of Carroll County hauled in over $128,000 between the two of them in just the last couple of years teaching concealed carry classes! That’s two deputies in one small Iowa county with a population of under 20,000! With over 275,000 Iowans possessing a carry permit these days, it’s estimated that close to $14,000,000 has been collected from gun owners, with local law enforcement officers collecting most of that. In light of these numbers, it’s obvious that your sheriff’s ability to be a credible source on the impact of Constitutional Carry is totally gone. Iowa has been held back in the advancement of Second Amendment freedom for a long time by anti-gun legislators, especially in our State Senate. As we all know, Iowa Gun Owners’ members have been steadily removing and replacing these anti-gun incumbents from office for four election cycles now — giving us a pro-gun majority for the first time since the 90’s. Now is the time to advance the Second Amendment agenda as far as we possibly can, as we never know when the political pendulum will swing back the other direction. The media, Bloomberg-funded groups, the ISSDA, and anti-gun legislators all but foamed at the mouth about the dreadful impact that ‘Shall Issue’ would have on Iowa — and they have been proved wrong. They were back at it this year, bringing forth dire predictions about what would happen in Iowa if we enacted Stand-Your-Ground law –- and again, they have been proved wrong! The fight over Constitutional Carry will be no different. Hopefully by reading some of the objections or lies listed above, you’ll be able to advocate even better for your gun rights when talking to legislators! 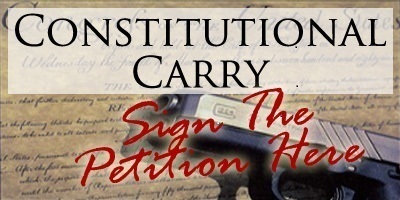 If you haven’t yet signed your petition for Constitutional Carry, I hope that after reading this email you’ll do just that. And, if you haven’t done so already, be sure to join Iowa Gun Owners right away as no organization fights harder in Des Moines for your gun rights. Finally, if you know of anyone else who is on the fence about Constitutional Carry, please make sure you forward this on to them! P.S. With the liberal media here in Iowa still bitter over losing the fight over Stand-Your-Ground law, the fight over Constitutional Carry is already starting to heat up! In the email above we disprove the most common objections to this common sense law. So make sure to read this, and forward it to your friends. And if you haven’t yet done so, be sure to join Iowa Gun Owners right away, as we need all hands on deck for what will be a major political fight!